The calendar aspects as well as the mythical history contained within the Sunstone heightened my admiration for the artist or artists responsible for producing such an awe inspiring piece of sculpture from the very beginning. I was so taken by the Sunstone that I decided that I would like to make a copy, so I downloaded a few photographs and also some drawings and began to draw the basic design features. It was then that I discovered that the layout was more complex than I first imagined as there were lots of concentric circles subdivided into various segments that did not seem easy to decipher and construct (See pic 1). I firstly focused on the multiple concentric circles making up the design. 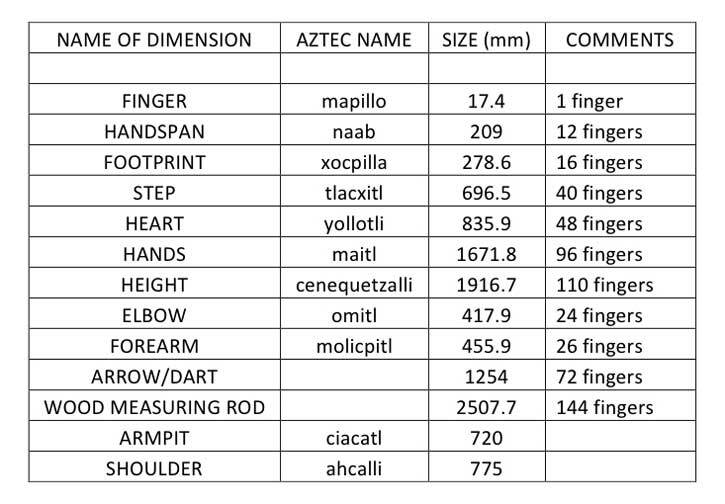 I had no idea at this time that there was information available on Aztec linear measurements and so I decided to find the smallest distance on the stone and made that a size of one unit of length. 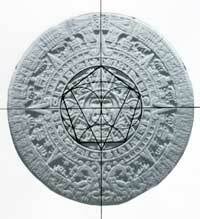 I assumed that all dimensions would be whole numbers as I thought at the time that the Aztecs worked in ratios and not fractions or decimal places. I then scaled all subsequent distances, from a picture of the sun stone, relative to the smallest distance of one unit in order to determine the radii and diameters of the main concentric circles within the design. 22, 24, 48, 50, 58, 60, 61, 66, 68, 72, 74, 75, 88, 90, 92, 102, 104, and 105. 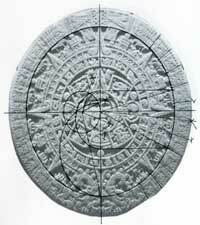 I then compared the radius of 105 with the actual size of the sunstone which was usually stated as 6ft. (1829mm) radius which divided by 105 = 17.42. 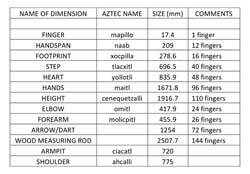 I then began to search for information on Aztec linear measurements I subsequently found several articles giving details of various measurements associated with different parts of the body. One article, ‘The Dimensions of Holiness’ by John E. Clark, listed several Aztec dimensions which I have shown graphically in Pic 2 and in tabulated form in Pic 3. 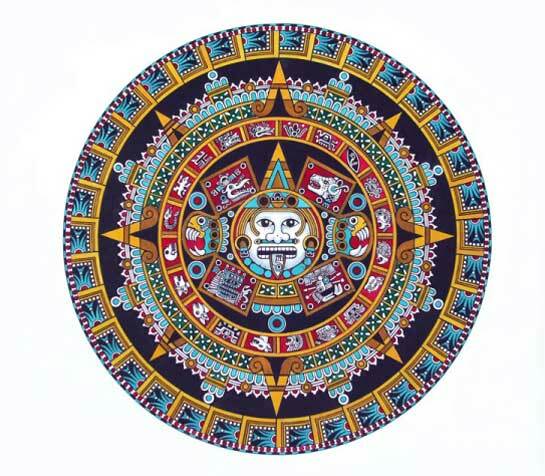 I conclude that my one unit dimension was compatible to the 1 finger dimensions of the Aztecs and that other Aztec dimensions might be found in the design. I then turned my attention to the various divisions of the concentric circles and how they could have been measured accurately. Although it was possible by trial and error or by the use of a protractor (see later) to divide the circles into their relative segments I looked at the possibility of being able to use other methods such as geometry or mathematics to construct them. • 208 segments – outside edge border design (See Pic 5). The 8, 16 and 32 segments could easily be constructed using geometry to first create an octagon and then using a compass to further subdivide the angle the circle of diameter of 176 is the best one to pick up the points of the sun rays (See Pic 6). The 96 segments can be constructed by firstly creating a hexagon and then using a compass to further subdivide the 60 degree segments into 96 segments. 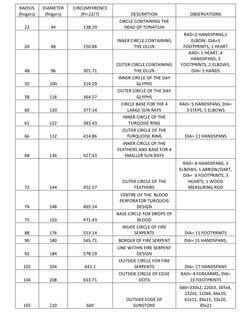 The circle of diameter 150 seems to be appropriate as it is the base for the blood drops (See Pic 7). To divide the circle into 20 segments it could be achieved by constructing a pentagon and then subdividing the five sides. 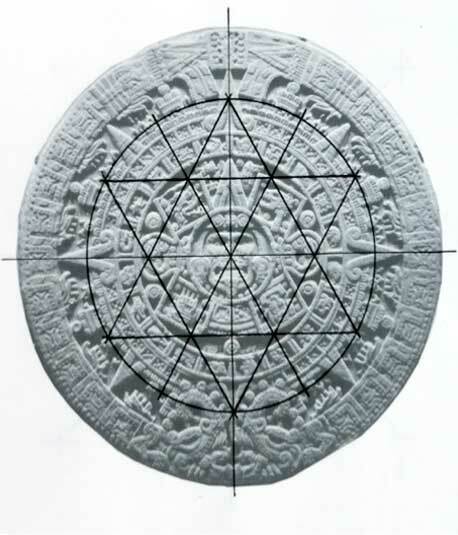 The circle with diameters 96 seemed to be the most likely one to use especially as the inner circle of 48 diameter can be used as the centre of two circles used in the construction of the pentagon (See Pic 8). The 34 segments can be achieved by constructing a 17 sided polygon and then sub-dividing to get the 34 divisions (See Pic 9). To divide the circle into 52, 104 and 208 would require a 13 sided polygon which could then be subdivided to give the required divisions. Although it is impossible to actually construct such a polygon there are several ways to produce one that is reasonably accurate (See Pic 10). As I looked for ways of dividing the circle into the various segments I noticed that one of the concentric circles had circumferences that was a whole number, this being the circle with radius 105. 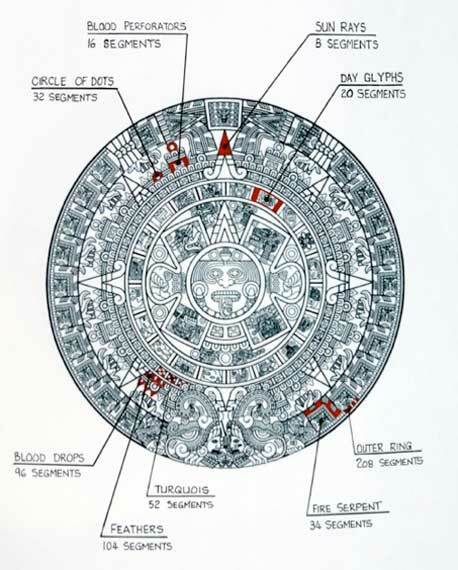 I assumed that the Aztecs were aware of Pi and wondered if they had used that knowledge to determine circles that could be used divide the circle into various segments (See Pic 11). The obvious circles with whole number circumferences would be those whose diameter was divisible by 7 (assuming Pi=22/7). However there was only one such circle and that was the outer edge circle with diameter 210. This circle has a circumference of 660 and could be divided into several combinations. ie. 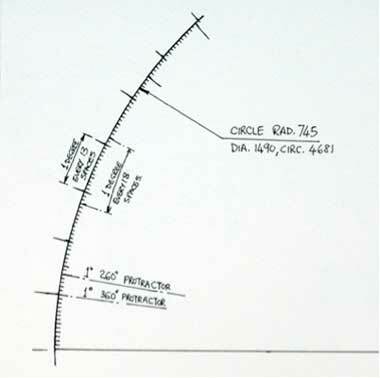 This circumference could be used to divide the circle into 4,8, 16, and 32 segments as well as 20 segments if necessary. 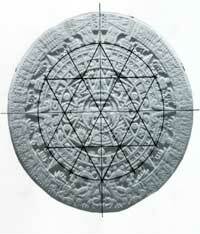 There were another circles that was almost whole and they were the circles with radius 60, (the base of the 4 large sun ray) and the circle with radius 92 (the circle contained in the fire serpents pattern). The circle with radius 60 has a circumference of 377.14 if we assume Pi = 22/7 however a more accurate version of Pi actually gives a circumference of 376.99 and 377 = 13x29. This would mean that you could measure around the circumference 29 fingers which would divide the circle into 13 segments. 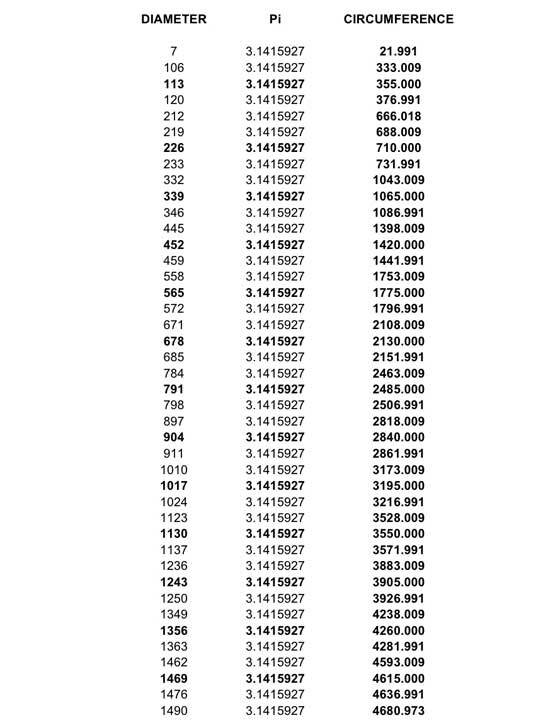 Further sub- dividing these segments using a compass would give you segments of 26, 52, 104 and 208. The circle with radius 92 has a circumference of 578.29 if we assume Pi = 22/7 however like the previous example if we use a more accurate value for Pi we get a circumference of 578.05 and 578 = 34x17. This would mean that you could measure around the circumference 34 fingers to give 17 segments or 17 fingers to give 34 segments. The fact that we have two different values of Pi being used seems to indicate that, like us, they may have used Pi = 22/7 for normal use and a more accurate version of Pi for more detailed work. As stated above many of the angles could have been produced by using a protractor so I set about trying to determine a method or methods required to construct one. 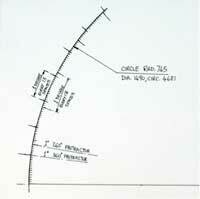 The first problem I had was how to construct a protractor that could be used to set of all of the required angles. A 360 degree protractor could be created on a diameter of 1146 which gives a circumference of 3600 with each degree being 10 spaces. 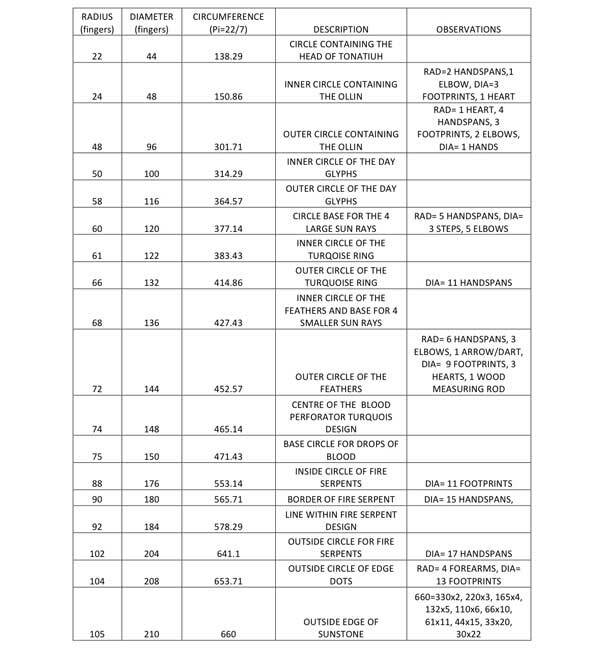 However this did not cover all of the angles required and I thought that it would be logical to copy what was already in place and being used as a calendar and to have a protractor with 260 divisions and also one with 360 divisions. A 260 degree protractor could be created on a diameter of 662 which gives a circumference of 2080 with each degree being 8 spaces. With a 260 degree protractor it is possible to sub-divide a circle into several more parts :-2,4,5,10,13,20,26,52,65, and 130. 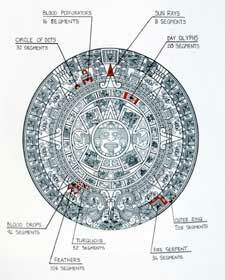 The 260 degree protractor would give a right angle of 65 degrees, the 20 day glyphs would each have an angle of 13 degrees whilst the 52 turquois patterns would be 5 degrees each. Unfortunately neither can sub-divide the circle into 17 or 34 segments. I then thought that it would be really good if you could combine both protractors into one. 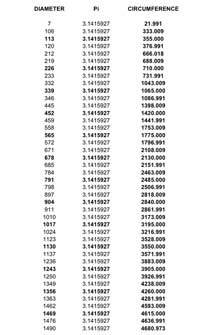 By multiplying 360x26 = 9360 which gives a circle of almost 2980 dia. And if you halved this diameter to 1490 this would give a circumference of 4681. 4681/ 260 = 18 and 4681/ 360 = 13. This means that on the 260 degree protractor one degree equals 18 spaces and on the 360 degree protractor one degree equals 13 spaces (See Pic 12). However if this was based on fingers then this protractor would be 25.926 metres in diameter and really too large. As a draughtsman I am always working with scale rulers and so I realized that what was needed was a scaled down protractor. 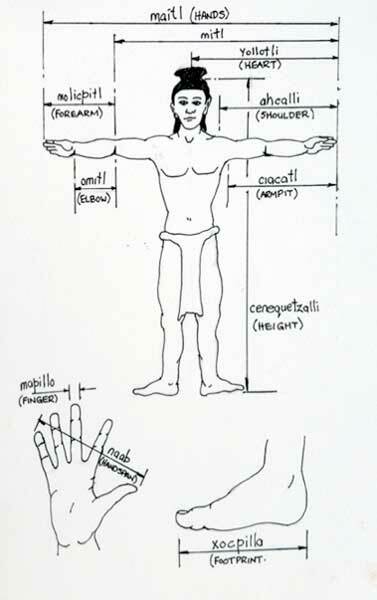 1 finger=1 hand spans gives a scale of 1/12th. 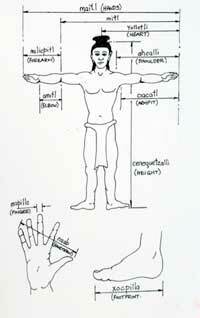 1 finger=1 elbow gives a scale of 1/24th. 1 finger=1 heart gives a scale of 1/48th. 1 finger=1 hands gives a scale of 1/96th. If we use a scale ruler to draw these sizes to scale it would mean that the 1 finger distance would need to be sub-divided. 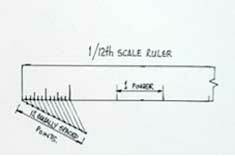 As it is only 17.4mm long the maximum practical sub-division would be 12 which would give a distance of 1.45mm . 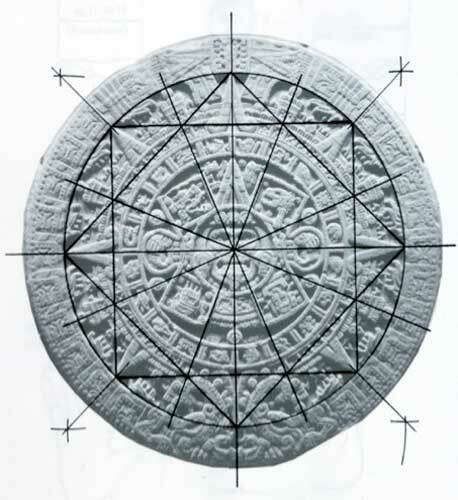 The 1/12th scale rule appears to be more useful when working with other Aztec dimensions (See Pic 13 on how to produce a 1/12th scale ruler). Going back to the protractor if we divide 25926mm by 12 = 2160.5mm which although still quite large would be a more practical size. Apart from the compass and the protractor the other useful tools for the draughtsman are the T square and the set square. Normally the set squares comprise a right angled triangle with either two 45 degree angles or a sixty degree and 30 degree angle. These are obviously related to the 360 degree circle and related to the construction of hexagons and octagons. An equivalent set square based on the 260 degree circle with a right angle of 65 degrees and two angles of 13 degrees and 52 degrees would be useful in the construction of pentagons and 20 sided polygons. 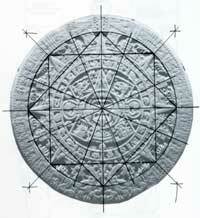 Many of the Aztecs measurements can be combined to produce Pythagorean right angled triangles (for example from Pic 2). These right angled triangles are traditionally used to produce 90 degree angles and as such could have been used in the construction of the sun stone design. 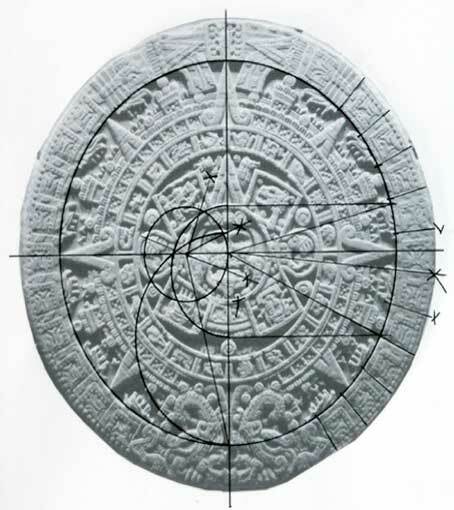 In theory the methods stated above could have been used to produce all of the required segments present in the sun stone design however all of the above comments and observations are only speculation on how the sunstone could have been designed and are not based on any facts or actual measurements of the sunstone itself. 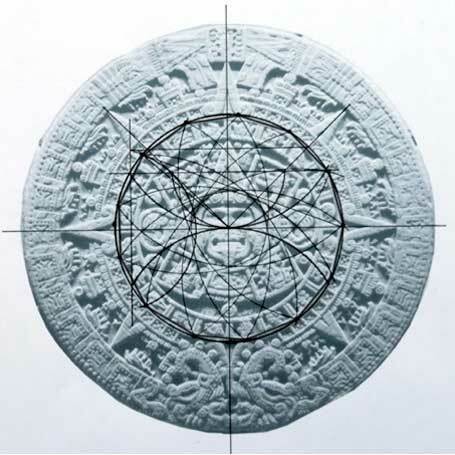 The artist could easily have used many other methods to design the sunstone which I am not aware of but I hope that at least this paper might stimulate comment and further study into such an important part of Aztec life. • Construction of Tridecagon (13 sides) – Wikipedia.